Planning is already starting for next year's New Cross and Deptford Free Film Festival. The last couple of years have seen thousands of people watching interesting films for free in all sorts of unusual locations (parks, churches, tattoo parlours...). If you want to get involved at any level - showing films, publicity, suggesting venues - come along to the first planning meeting on Monday 10th November, 8 pm at the Job Centre pub on Deptford High Street (details here). 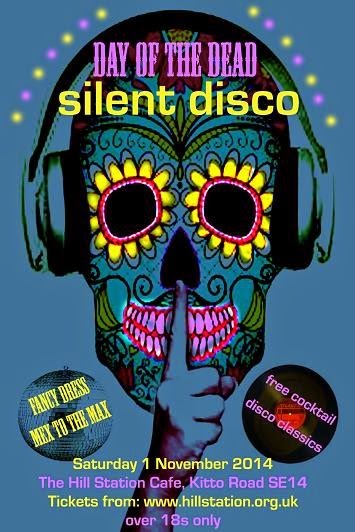 'Saturday 1 November 2014 is Mexican Day of the Dead and to celebrate The Hill Station Café will again be teaming up with the Silent Disco crew to create a Fabulously Fluorescent, Luminously Lovely, Ultra Violet, Psychedelic Disco. A top line-up of local DJ’s will keep your feet firmly on the dance floor with a selection of the best banging party tunes, decadent disco hits and old-skool hedonism. It’s a fancy dress thing - the more skulls the merrier (but of course you don't have to). The best dressed Senor and Senorita will be crowned "King and Queen of the Dead". Everybody gets a free cocktail on arrival, and there'll be lots of extra scary stuff too'. This looks SUCH fun. A sell out last time and so I only got a look in but the trouble that some people took with their dress was awesome to behold - but no pressure for everyone to do the same, the crowd was big enough to get lost in. So get tickets while you can. And you won't miss out on the fireworks - from just outside the hill station you can see across the Lower Park to the City and points north east, and, of course, from the Upper Park (a couple of minutes away for a breath of fresh air) you have the whole panorama.